Wire/Adapter: This conversion is simple and can be done in a wire or with a small adapter connected to the wire. This is the preferred low cost solution. Converter Box: This conversion requires a stand-alone box. Sometimes these boxes require power as they are effectively very small computers or video cards. Sometimes, the cost of a converter box outweighs the desire to convert the wire. It might be cheaper to buy a new DVD player than to try to convert the wires coming out of the one you have. TV Tuner: This is a special type of converter box that selects one specific channel from a coaxial cable. RF Modulator: This is a special type of converter box that converts the input into a specific TV channel - usually Channel 3. You may notice that you might need two converters to get what you need. For example: DVI-I converts to VGA which converts to Component, but you can't find a cable to convert directly from DVI-I to Component. This should be technically possible. The only reason you don't find this adapter is because there isn't enough demand for it. HDMI & DisplayPort cables also carry audio signals. Converting this cables will probably cause the audio signal to be lost. RF Modulators can convert Composite or S-Video inputs into Coaxial output. Most RF Modulators will only output the video on Channel 3 or 4, but some actually let you pick any channel up to 125. 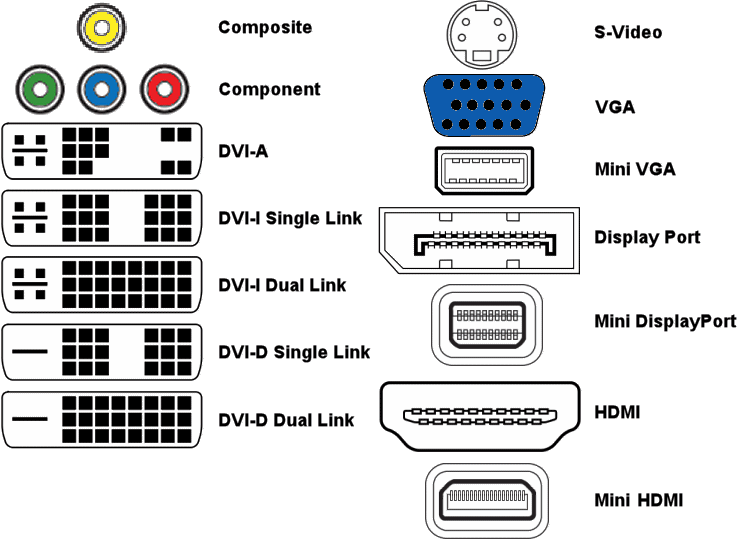 Both Composite and S-Video cables are limited in how long the cables can be. Coaxial cable doesn't have this problem and it is much cheaper. If your television only has one Coaxial input and it is already in use, then you can use an A/B switch to switch between 2 different Coaxial inputs. Another alternative is to combine both Coaxial wires. SeeReverse Coaxial Splitter as Combiner for more information. If your television only has one Coaxial input and it is already in use, then you can use an A/B switch to switch between 2 different Coaxial inputs. Under special circumstances, coaxial cables can be combined. Say you have a Coax feed from a RF Modulator with a signal only on Channel 3. You also have an antenna/cable/satellite feed and there is no station on channel 3. Then, you can theoretically combine the 2 coaxial feeds into 1 by using a Coaxial splitter backwards. Change to channel 3 to watch the video from the RF Modulator. Watch the other channels as normal. If you are going to attempt to do this, you should get a RF Modulator that lets you pick any channel. Just because there is no station on a given channel doesn't mean that there isn't any noise on that channel. By having a RF Modulator that lets you pick any channel up to 125, there is a very good chance you will be able to find an open clean channel. You may also need to get a filter to clean/remove the noise from the antenna/cable feed to be able to properly combine the Coaxial feeds. The filter will cost more, but combining the feeds is better than having to manually use the A/B Switch to change between inputs. Splitting Coaxial wire is simple. You can find splitters that will split into 2, 4 or more lines. Using a splitter will degrade the signal strength, and sometimes a cable booster/amplifier will be required. To make things easy, there are all-in-one booster/splitter units. You cannot use a splitter on a Coaxial wire coming directly from the Satellite Dish. You must use a multiplexer instead. Splitting cable for satellite is much more complicated. A multiplexer is required to split a satellite signal. A single satellite dish may produce 2, 3, 4 or more coaxial outputs, each one carrying a different signal. You may even have multiple satellite dishes to get all the channels you want. Simply splitting one of these wires for 2 different televisions will not work. A multiplexer will take all of the satellite wires and produce additional outputs. The capabilities of a multiplexer are written as 2x4 (converts 2 wires into 4) or 5x8 (converts 5 into 8). When purchasing a multiplexer, make sure it will work with your service (DirecTV / DishNetwork), and realize that some of the inputs may be dedicated for a local channel antenna or for international satellites and might not suit your needs. Splitting Coaxial wire is as simple as using a Y RCA splitter. To split a audio/video signal, you will need 3 splitters: one for the video (yellow), one for the right audio (red), and one for the left audio (white). There is some signal loss when splitting composite wire or when running composite wires a long distance. If you have a computer with a VGA output that you want to connect to a TV that has Component but not VGA input, then you might be able to use a VGA to Component Converter Box. BNC cables are sometimes used in place of Composite or Component cables. You will know from either the coloring or labeling what type of cable it is. Red, Yellow, White (Right, Left, Video) for Composite or Green, Blue, Red (Y, Pb, Pr). BNC connectors have either pins or holes on the sides of the connector. Line up the pins with the hole and give the connector a half twist to secure it.